The basic knowledge of extensions used in eXo Platform, consisting of UI Extensions, Authoring Extension, and Auxiliary attributes for documents. The knowledge of some overridable components in eXo Platform so that you can control how these components work by implementing or extending default implementations, and then reconfigure these new components in the configuration.xml file. Introduction to Data structure of eXo Platform components, including Social, Calendar, Wiki, Forum, FAQ, and Poll. Instructions on how to configure the templates used for Spaces, Content and FAQ applications. Introduction to events of eXo Platform modules, including: Portal, ECMS, Social, and Forum. Introduction to the UI Extension framework that allows developers to write plugin for eXo applications. Details of an extended Publication plugin used to manage the lifecycles of documents in Content, and introduction to Publication Manager which manages lifecycles and contexts in Content and its details. Details of how to create the DocumentContext which stores some auxiliary attributes of the document and helps document listeners make decision based on these attributes. Some of the eXo Platform applications provide an extension mechanism which enables you to extend their capabilities, including: Sites Explorer, Content Administration, and more. In eXo Platform, UI Extension helps expanding the dynamic children of UI Component. With UI Extension, you can add, change or remove a lot of children in UI Component more easily than in traditional ways. Also, it is simple for you and your team to control applications containing a few fixed components. But when you start an application which contains a lot of components, transactions, filters and permissions on each component, it is really a disaster. As each developer may handle problems in their own way, it also likely raises the convention problem. Thus, UI Extension framework was created to solve the management dynamic components on the applications and free developers from controlling too many of them. Creating simple child UI Components. Applying a filter on each component for a variety of purposes more easily. Adding or removing extensions simply by configuration. This class is used to manage all extensions available in the system. The target is to create the ability to add a new extension dynamically without changing anything in the source code. UIExtensionManager is implemented by UIExtensionManagerImpl. Object Type: point to the UI Extension lib class. Type: the “parent” UI component which is extended by your UI Extension. Rank: used to sort by Collection of UI Extension. Component: point to the UI Extension definition class. This is what your UI Extension will be added to (in this example, the parent UI Componet is UIPageToolBar). All extensions of this component are got by UIExtensionManager. Each UI Extension has a list of filters depending on variety of purposes. It indicates which UI Extension is accepted and which is denied. You are free to create your own filter extended from UIExtensionAbstractFilter. Internal filters are part of the business logic of your component. For example, if your component is only dedicated to articles, you will add an internal filter to your component that will check the type of the current document. MANDATORY Checks if the action related to the extension can be launched and if the component related to the extension can be added to the WebUI tree. This filter is required to launch the action and add the component related to the extension to the WebUI tree. If it succeeds, you need to check the other filters. If it fails, you need to stop. REQUISITE Checks if the action related to the extension can be launched. This filter is required to launch the action to the WebUI tree. If it succeeds, you need to check the other filters. If it fails, you need to stop. REQUIRED Checks if the action related to the extension can be launched and can be used for adding warnings. This filter is required to launch the action. If it succeeds or fails, you need to check the other filters. OPTIONAL Checks if the action related to the extension can be launched and can be used for the auditing purpose. This filter is not required to launch the action. If it succeeds or fails, you need to check the other filters. There are 2 conditions for filtering: Accept and onDeny. Accept: Describe the “Accept” condition, and how a UI Extension can accept by a context. onDeny: What you will do after the filter denies a UI Extension by a specific context (generating a message for pop-up form, for example). You have known how and where the filter is put in a UI Component, but when it is gonna fire? It falls into 2 situations: when you get it and when it is action fire. Thus, you should ensure that your UI Extension is always trapped by its filter. External filters are mainly used to add new filters that are not related to the business logic to your component. A good example is the UserACLFilter which allows you to filter by access permissions. Implement UIExtensionManager by using UIExtensionManagerImpl. Plug UIExtensionPlugin in UIExtensionManager by using the registerUIExtensionPlugin() method. List all the UI Extension’s definitions. You can also define your own external filter (optional). Create the parent UI Component class. Create the UI Extension class. UIExtensionPlugin is responsible for looking up all UI Extension definitions, thus you can use it to obtain all UI Extensions, then plug it into UIExtensionManager. At present, all UI Extensions in your project will be managed by UIExtensionManager. Now you can get UI Extensions everywhere by invoking the getUIExtensions(String objectType) method. UIExtension, in particular, the UIExtension’s filter. Either internal filter or external filter has the accept method, thus the adding process will be successful if accept returns ‘true’ and vice versa. Context will be the parameter of the accept method. The final step is to present UI Extension in a template. You are free to customize your action's Stylesheet. Information about new states and new profiles of the extended publication that are enabled in Content. Introduction to new properties added to the new publication plugin that allows you to manage the content publication in a defined period. Introduction to the new authoring mixin that supplies more information about the document creator. Sample code of lifecycle, information about 3 lifecycles, and instructions on how to listen to a lifecycle and to perform tasks when a content’s state is updated. Details of context, its sample code and rules. Introduction to the new authoring mixin that supplies more information about the document creator, its sample code and details of querying based on publication status. This extended publication has new states and new profiles that are enabled in Content. Author: This profile can edit a content and mark this content as redacted. Approver: This profile approves a pending content (marked by the Author). Publisher: This profile publishes contents or marks them as “Ready for publication” in multi-server mode. Archiver: An administrative profile which moves contents to an archive storage. enrolled: It is a pure technical state, generally used for content creation. draft (Author): Content is in editing phase. pending (Author): The author validates the content. approved (Approver): A content is approved by the manager. inreview (Manager): This state can be used when a second approval state is needed (for i18 translation for example). staged (Publisher): A content is ready for publication (multi-server mode). published (Publisher or Automatic): A content is published and visible in the Live mode. unpublished (Publisher or Automatic): A content is not visible in the Live mode. obsolete: A content can still be published but it is not in an editing lifecycle anymore. archived (Automatic): A content is archived and ready to be moved in the archive workspace if enabled. The Content rendering engine does not know anything about publication dates, so another service needs to manage that. When the publisher sets start/end publication dates, he can “stage” the content. The content will go automatically to the “published” state when the start date arrives and to the “unpublished” state after end date. A cron job checks every hour (or less) all contents which need to be published (the start date in the past and the “staged” state) or unpublished (the end date in the past and the “published” state). Staged: in multi-server mode, the publisher can only put the content to the “staged” state and wait for auto-publication. Published: in single-server mode, the publisher can directly publish a content (with or without publication dates). A staged document with null publication start date is published instantly. A document with null publication end date is published forever. See the export section for more information about the CRON jobs. The Publication Manager manages lifecycles and contexts in the Content platform. It allows managing different lifecycles based on different publication plugin in the platform. getLifecycles: returns a list of lifecycles (see below), with lifecycle name, publication plugin involved and possible states. getContexts: returns a list of context, with name, related Lifecycle and other properties (see below). getContext: returns a context by its name. getLifecycle: returns a lifecycle by its name. getLifecycleFromUser: returns a list of lifecycles in which the user has rights (based on membership property). A lifecycle is defined by a simple vertical workflow with steps (states) and profiles (membership). Each lifecycle is related to a Publication plugin. In this example, there is one lifecycle with states. This lifecycle is based on AuthoringPublicationPlugin. With this configuration, your listener my.package.MyListener will be executed each time a content’s state is changed. Remote User: The current user who can create/edit the content. Current site name: The site from where the content is created (not the storage but the navigation). Node: The node which you want to enroll. Membership: Does the current user have this membership? Site: On this particular site, you want to enroll contents in a specific lifecycle. Path: You can enroll contents in the lifecycles based on their path (from the Node). Type of content: You can enroll contents in the lifecycles based on their nodetype (from the Node). Because each site has a content storage (categories + physical storage), you can select the right lifecycle for the right storage/site. To avoid conflicts on contexts, you can set a priority (the less is the best). The content creator has the manager:/company/finances membership. The content is stored in repository:collaboration:/documents/company/finances or any subfolders. The content is a ‘exo:article’. If not, you will continue with context3. The content is a exo:article. The contexts will be used only when the content is created and when you want to enroll it in a lifecycle for the first time. Once you have the corresponding lifecycle, you will set the lifecycle inside the content (see New Authoring Mixin) and the context service will not be called again for this content. When adding the content in a lifecycle, set the publication:lifecycle_ property with the corresponding lifecycle. A content can be in one lifecycle only. query: select * from nt:base where publication:currentState”draft” and publication:lastUser=”benjamin”. All the contents you have to approve. call: PublicationManager.getLifecycles('benjamin','approved') => returns lifecycles where you can go to the ‘approved’ state. query: select * from nt:base where publication:currentState="pending" and publication:lifecycle="lifecycle1" orpublication:lifecycle="lifecycle3". All the content that will be published tomorrow. query: select * from nt:base where publication:currentState="staged" and publication:startPublishedDate=”xxxx”. By default, your activities, such as writing a document, and uploading a file, are published on the activity stream. However, you can decide to publish these activities or not by creating a context named DocumentContext for a specific document. This context stores some auxiliary attributes of the document and helps document listeners make decision based on these attributes. The DocumentContext class is able to help developers manage various kinds of actions with a document based on its auxiliary attributes. You can be free to define new attributes for yourself. Information about Social components which can be overriden, including Relationship listener plugin, Profile listener plugin, and Space listener plugin. Information about 2 overridden components in Forum, consisting of ForumEventLifeCycle, and BBCodeRenderer. Information about the AnswerEventLifeCycle component which installs event updates for the Answers data that is injected while saving answers, saving questions or posting comments. Information about the EventLifeCycle extension point used in the Calendar application of eXo Platform. Relationship listener plugin: Enables you to listen to events of a relationship between users. Profile listener plugin: Enables you to listen to events of profiles of users. Space listener plugin: Enables you to listen to events of spaces. RelationshipListenerPlugin enables you to listen to events of a relationship between users. By implementing this overriable component, users will be notified when the connection request is accepted or the connection is removed. Create a new class, for example, RelationshipPublisher that extends RelationshipListenerPlugin. Override functions in this created class. In each function, you can write anything to meet your needs. The confirmed function is called when a connection request is accepted. The removed function is called when a connection is removed. Add a new configuration to the /social-config/src/main/resources/conf/social/core-configuration.xml file with the type that is the class created in Step 1. ProfileListenerPlugin enables you to listen to events of profiles of users. By implementing this overriable component, a notification will be updated in Activity Stream when the profile is changed. Create a new class, for example, ProfileUpdatesPublisher that extends ProfileListenerPlugin. The avatarUpdated function is called when the avatar picture of a user is updated. The basicInfoUpdated function is called when the basic account information of a user is updated. The contactSectionUpdated function is called when the contact information of a user is updated. The experienceSectionUpdated function is called when the experience section of a user is updated. The headerSectionUpdated function is called when the header section of a user is updated. SpaceListenerPlugin enables you to listen to events of spaces. By implementing this overriable component, the notification will be updated in Activity Stream of the space or of members when the space information is changed or when a user joins or leaves the space. Create a new class, for example, SpaceActivityPublisher that extends SpaceListenerPlugin. The grantedLead function is called when a member is promoted as a space manager. The revokedLead function is called when a user is demoted from a space manager. The joined function is called when a user joins a space. The left function is called when a user leaves a space. The spaceRenamed function is called when a space is renamed. The spaceDescriptionEdited function is called when the description of a space is changed. The spaceAvatarEdited function is called when the space avatar is changed. ForumEventLifeCycle enables you to listen to the lifecycle of a forum. By implementing ForumEventLifeCycle, you can be notified of new posts and replies, categories and topics. This installation will be injected when the data flow is called to save data. BBCodeRenderer is used in the core of Forum to render BBCodes. In which, the data input is text, containing BBCode tags. The data output will be BBCode tags which have been encrypted into HTML tags. Create a new class that extends ForumEventListener. Override functions in this created class. In each function, you can write anythings to meet your needs. The function saveCategory is called when a category is added and/or edited. The function saveForum is called when a forum is added and/or edited. The addTopic function is called when a topic is added. The updateTopic function is called when a topic is updated. The addPost function is called when a post is added. The updatePost function is called when a post is updated. Add a new configuration to the configuration.xml file with the type that is the class created in the Step 1. In which, ExtendedBBCodeProvider is the class to implement BBCodeProvider. AnswerEventLifeCycle installs event updates for the Answers data that is injected while saving answers, saving questions or posting comments. You can find the configuration file of this component here. In which, AnswersSpaceActivityPublisher is the class to implement ForumEventLifeCycle. Create a new class that extends AnswerEventListener. The saveQuestion function is called when a question is added and/or edited. The saveAnswer function is called when an answer is added and/or edited. The saveAnswer function is called when answers are added and/or edited. The saveComment function is called when a comment is added and/or edited. EventLifeCycle is an extension point used in Calendar. You can find the configuration file of this component at: integration/integ-calendar/integ-calendar-social/src/main/resources/conf/portal/configuration.xml. CalendarSpaceActivityPublisher implements EventLifeCycle. It writes activities in the space activity stream when events or tasks are added/modified. 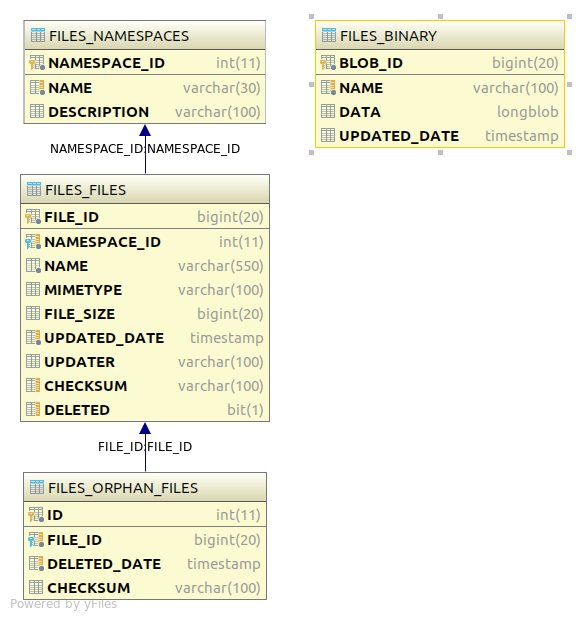 A description of the Files Data Structure. A description of the Social Data Structure. 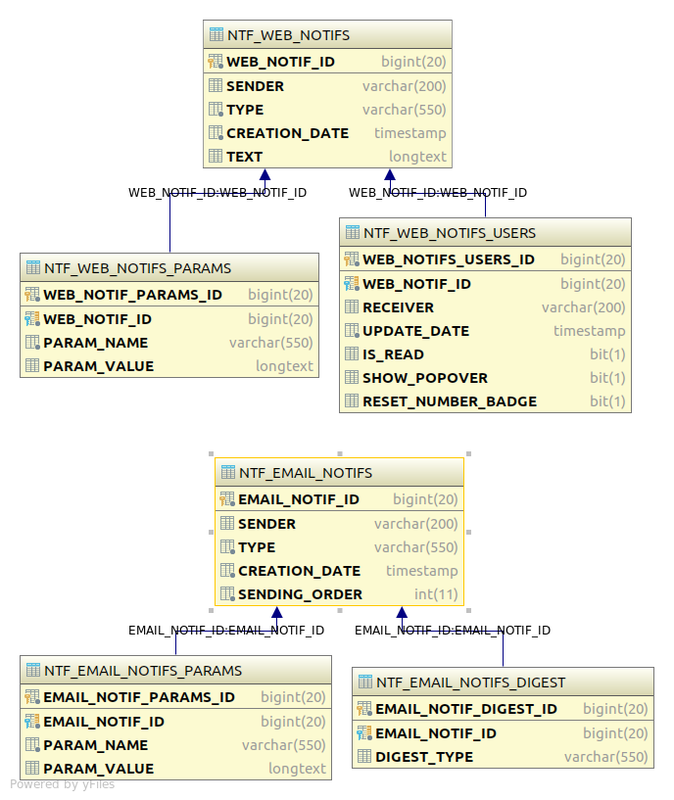 Introduction to the Calendar JCR structure, details of child nodes, node types and properties of the following nodes: calendars, eventCategories, categories, eXoCalendarFeed, YY%yyyy% and calendarSetting. Introduction to the whole Data structure of Wiki. Introduction to the whole JCR structure of Forum, and comprehensive knowledge of its main nodes: Forum System and Forum Data. A description of Notifications Data Structure. A description of Email queue Data Structure. A description of Settings Data Structure. Introduction to the whole JCR structure of FAQ, and comprehensive knowledge of its main nodes: Category, FAQ setting, Template for FAQ. 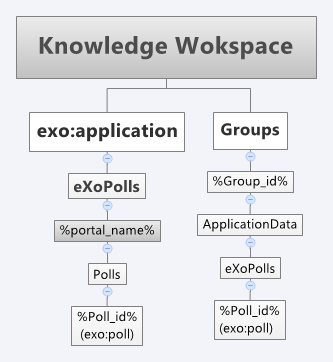 Introduction to the whole JCR structure of Poll, and properties of its node type (exo:polls). A description of Login History Data Structure. To learn more about the JCR Structure, you should have the certain knowledge of JCR. BLOB_ID ID The unique ID of the binary. NAME VARCHAR The name of the binary. DATA BLOB The data of the binary. UPDATED_DATE TIMESTAMP The updated date of the binary. NAMESPACE_ID ID The unique ID of the namespace. NAME VARCHAR The name of the namespace. DESCRIPTION VARCHAR The description of the namespace. FILE_ID ID The unique ID of the file. NAMESPACE_ID ID The ID of the namespace of the file. NAME VARCHAR The name of the file. MIMETYPE VARCHAR The mimetype of the file. FILE_SIZE VARCHAR The size of the file. UPDATED_DATE VARCHAR The updated date of the file. UPDATER VARCHAR The id of the user who did the last update of the file. CHECKSUM VARCHAR The checksum of the file. DELETED BOOLEAN True if the file is deleted. ID ID The unique ID of the orphan file. FILE_ID ID The ID of the related file in table FILES_FILES. DELETED_DATE TIMESTAMP The date of the deletion of the file. CHECKSUM VARCHAR The checksum of the orphan file. ACTIVITY_ID ID The unique ID of the activity or comment. APP_ID ID The ID of the sender application (if posted by an application). BODY VARCHAR The body of the activity. PROVIDER_ID VARCHAR The provider of the poster. Can be “organization” for users or “spaces” for spaces. HIDDEN BOOLEAN True if the activity is hidden. UPDATED_DATE TIMESTAMP The date of the last update of the activity. LOCKED BOOLEAN True if the activity is locked. OWNER_ID VARCHAR The ID of the owner of the activity. PERMALINK VARCHAR The permanent link of the activity. POSTED TIMESTAMP The posted date of the activity. POSTER_ID ID The ID of the poster of the activity. TITLE VARCHAR The title of the activity. TITLE_ID ID The type of the title. For example “forum.add-topic” or “space_avatar_edited”. TYPE VARCHAR The type of the activity. 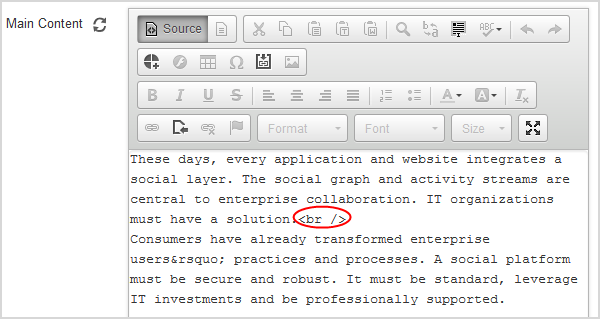 For example “ks-forum:spaces” or “exosocial:spaces”. IS_COMMENT BOOLEAN True if the activity is a comment. PARENT_ID ID The ID of the parent activity. The table SOC_ACTIVITY_LIKERS stores the likers of an activity and the time of the like. ACTIVITY_ID ID The ID of the activity. LIKER_ID ID The ID of the user who liked the activity. CREATED_DATE TIMESTAMP The date of the like. The table SOC_ACTIVITY_TEMPLATE_PARAMS stores information about the activity template. TEMPLATE_PARAM_VALUE VARCHAR The value of the template parameter. TEMPLATE_PARAM_KEY VARCHAR The name of the template parameter. The table SOC_STREAM_ITEMS stores informations of the items of the activoty stream. STREAM_ITEM_ID ID The unique ID of the stream item. OWNER_ID ID The ID of the owner of the stream. UPDATED_DATE TIMESTAMP The last updated date of the stream item. The Table SOC_MENTIONS store all the user mentions in the activity stream. MENTION_ID ID The unique ID of the mention. ACTIVITY_ID ID The ID of the activity containing the mention. MENTIONER_ID VARCHAR The ID of the mentioner. The table SOC_SPACES stores the spaces. SPACE_ID ID The unique ID of the space. PRETTY_NAME VARCHAR The name of the space. DISPLAY_NAME VARCHAR The display name of the space. DESCRIPTION VARCHAR The description of the space. AVATAR_LAST_UPDATED TIMESTAMP The date of the last update of the space avatar. GROUP_ID ID The ID of the group linked to the space. URL VARCHAR The URL of the space. CREATED_DATE TIMESTAMP The creation date of the space. TYPE VARCHAR The type of the space. BANNER_LAST_UPDATED TIMESTAMP The date of the last update of the space banner. The table SOC_SPACES_MEMBERS stores the list of users who are members of a given space. SPACE_MEMBER_ID ID The unique ID of the space membership. SPACE_ID ID The ID of the space. USER_ID ID The ID of the user. LAST_ACCESS TIMESTAMP The last access date of the user in the space. VISITED BOOLEAN True if the user has already visited the space. The table SOC_APPS stores the activated applications in each space. SPACE_ID ID The ID of the space membership. APP_ID VARCHAR The ID of the application. APP_NAME VARCHAR The name of the application. REMOVABLE BOOLEAN True if the application can be removed from the space. STATUS NUMBER The status of the application in the space. Can be 0 (enabled) or 1 (disabled). The table SOC_IDENTITIES stores the identities of the platform. An identity is a generic entity which is linked to a concrete entity like an user or a space. IDENTITY_ID ID The unique ID of the identity. REMOTE_ID VARCHAR The ID of the entity linked to the identity (for example a user id or a space id). ENABLED BOOLEAN True if the identity is enabled. DELETED BOOLEAN True if the identity is deleted. AVATAR_FILE_ID ID The ID of the file of the identity avatar in the table FILES_FILES. CREATED_DATE TIMESTAMP The creation date of the identity. BANNER_FILE_ID ID The ID of the file of the identity banner in the table FILES_FILES. The table SOC_IDENTITY_PROPERTIES stores the properties of an identity. It allows to add any property to an identity. NAME VARCHAR The name of the property of the identity. VALUE VARCHAR The value of the property of the identity. The table SOC_CONNECTIONS stores the connections between identities (users, spaces, …). CONNECTION_ID ID The unique ID of the connection. SENDER_ID ID The ID of the sender of the connection. RECEIVER_ID VARCHAR The ID of the receiver of the connection. The table SOC_IDENTITY_EXPERIENCES stores the job experiences of an identity. COMPANY VARCHAR The company of the experience. POSITION VARCHAR The position in the company for the experience. START_DATE TIMESTAMP The start date of the experience. END_DATE TIMESTAMP The end date of the experience. SKILLS VARCHAR The skills of the experience. DESCRIPTION VARCHAR The description of the experience. The Calendar data are saved in eXo-JCR under the CalendarApplication data directory. The Calendar JCR Structure is divided into two main branches: one for public (exo:application) and the other for users (Users). exo:id String false The Id of the calendar. exo:name String false The name of the calendar. exo:description String false The brief description of the calendar. exo:viewPermissions String true The list of users/groups having the view permissions. exo:editPermissions String true The list of users/groups having the edit permissions. exo:groups String true The list of user groups to which the calendar belongs. exo:categoryId String false The Id of the category containing the calendar. exo:calendarColor String false The color name of the calendar that is defined in the org.exoplatform.web ui.form.ext.UIFormColorPicker class (such as Sky blue, Powder blue). exo:calendarOwner String false The name of the user creating the calendar. exo:locale String false Location where the calendar is set in format of the uppercase ISO 3166 3-letter country code. exo:timeZone String false The Id of the time zone that is set by the user in compliance with the Java class: java.util.TimeZone. exo:publicUrl String false The public ICAL link of the calendar. exo:privateUrl String false The private ICAL link of the calendar. When a user shares his own calendar with other users, the Id of the calendar node is referred to the node under the sharedCalendar node: CalendarApplication/sharedCalendars/%user_id% following the JCR reference mechanism. In case of users’ private calendar, two mixin node types exo:remoteCalendar and exo:calendarShared can be added to the exo:calendar node type. exo:remoteUrl String false The URL of the remote calendar. exo:remoteType String false The type of the remote calendar, including ICalendar (.ics) and CalDav. exo:username String false The username used to access the remote calendar. exo:password String false The password used to access the remote calendar. exo:lastUpdated Date false The last update of the remote calendar. exo:beforeDate String false The period before the current date in which the calendar is checked out, including the values: None (the unlimited time), 1 week, 2 weeks, 1month, 2 months, 3 months, 6 months and 1 year. exo:afterDate String false The period after the current date in which the calendar is checked out, including the values: Forever (the unlimited time), 1 week, 2 weeks, 1month, 2 months, 3 months, 6 months and 1 year. exo:sharedId Reference true The user Ids who are shared the calendars. exo:fileName String false The name of the attached file. 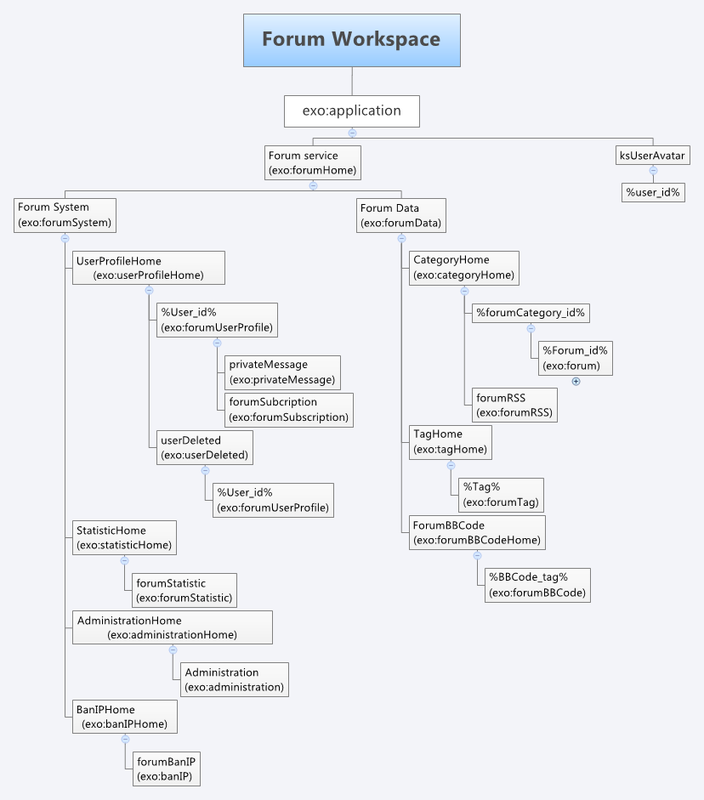 The eventCategories node contains all event categories. When an event category is created, it is stored in a node of the exo:eventCategory type, under the eventCategories node defined at the path: CalendarApplication/eventCategories/%eventcategory_id%. exo:id String false The Id of the category to which an event belongs. exo:name String false The name of the category to which an event belongs. 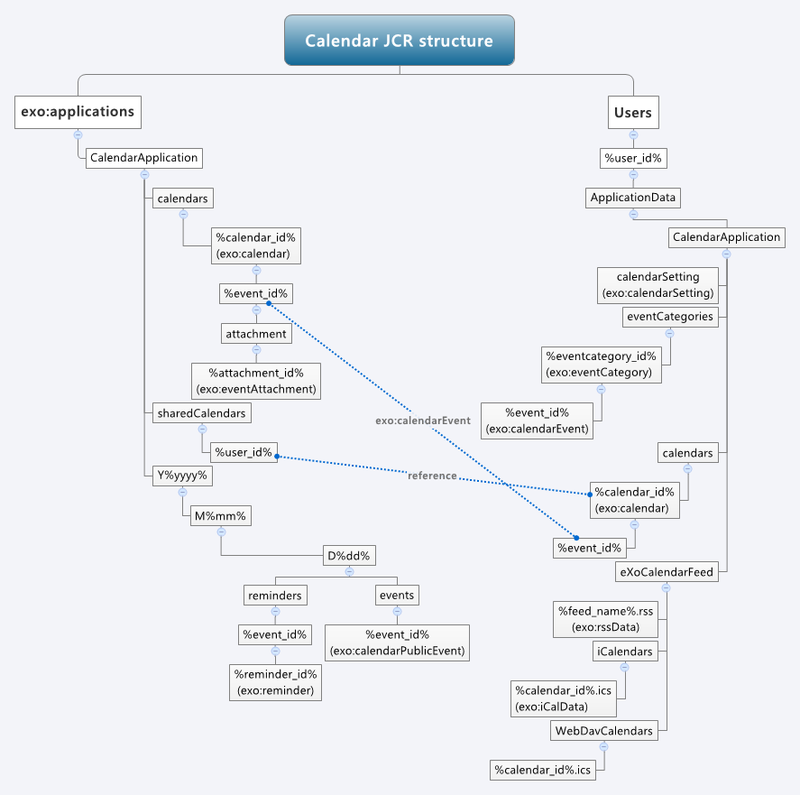 Each event category node contains the calendar event node of the exo:calendarEvent type. This node of the exo:calendarEvent type is stored at the path: CalendarApplication/eventCategories/%eventcategory_id%/%event_id%. exo:id String false The Id of the event. exo:eventType String false Type of the event, including Event and Task. exo:summary String false The summary of the event. exo:location String false The location where the event will take place. exo:taskDelegator String false The name of the user being delegated the task. exo:description String false The brief description of the event. exo:eventCategoryId String false The Id of the category containing the event. exo:eventCategoryName String false The name of the category containing the event. exo:calendarId String false The Id of the calendar containing the event. exo:fromDateTime Date false The start time of the event. exo:toDateTime Date false The end time of the event. exo:priority String false The preference order of the event, including 4 values: none, low, normal, high. exo:isPrivate Boolean false Defines if the event is private or not. exo:eventState String false The state of the event which depends on each event type. exo:invitation String true The list of email addresses of users being invited to the event. This property is for the Event type only. exo:participant String true The list of users being invited to the event. This property is for the Event type only. exo:participantStatus true String The status of the participant, including name and status value. exo:message String false The content of the invitation email. exo:repeat String false Repetition type of the event, including: “norepeat”, “daily”, “weekly”, “monthly”, “yearly”, “weekend”, “workingdays”. exo:sendOption String false The option to notify users before sending the invitation via email: never (not sending all time), always (sending without asking) and ask (asking before sending). The eXoCalendarFeed of the nt:unstructured type contains iCalendars, webDavCalendars as child nodes and others of the exo:rssData type. exo:baseUrl String false The original link to the RSS source. exo:title String false The title of the feed. exo:content Binary false The content of the feed. The iCalendars node of the nt:unstructured type contains the child nodes of exo:iCalData type. exo:data Binary false The exported content of the calendar in the ics.format. The webDavCalendars node of the nt:unstructured type contains the child nodes of the exo:caldavCalendarEvent type. exo:caldavHref String false The URL of the remote calendar event. exo:caldavEtag String false The tag of the remote calendar event. The Y%yyyy% of the nt:unstructured type has the name beginning with the Y character followed by the year name having 4 numbers. It contains all the child nodes of M%mm%. The M%mm% of the nt:unstructured type has the name beginning with the M character followed by the month name having 2 numbers. It contains all the child nodes of D%dd%. The D%dd% of the nt:unstructured type has the name beginning with the D character followed by the date having 2 numbers. This node has two child nodes: reminder and events. The reminder node of the nt:unstructured type contains the child nodes named basing on the Id of the event. This child node also has the nt:unstructured type. Each node is used to classify reminders of the same event. Each reminder is stored under a node of the exo:reminder type: CalendarApplication/Y%yyyy%/M%mm%/D%dd%/reminders/%event_id%/%reminder_id%. exo:id String false The Id of the reminder. exo:eventId String false The event Id of the reminder. exo:creator String false Defines who creates the reminder. exo:alarmBefore Long false The amount of time that the reminder message is sent before the event starts. exo:email String false The list of emails to which the reminder message is sent. exo:timeInterval Long false Interval for resending the reminder message in minutes. exo:reminderType String false The types of reminders, including email and pop-up. exo:fromDateTime Date false The start time to send the reminder. exo:remindDateTime Date false The time to send the reminder. exo:isRepeat Boolean false Checks if the reminder is repeated or not. exo:isOver Boolean false Checks if the reminder is expired or not. exo:summary String false The summary of the reminder. exo:description String false The brief description of the reminder. The events node of the nt:unstructured type contains the child node of the exo:calendarPublicEvent type defined at the path: CalendarApplication/Y%yyyy%/M%mm%/D%dd%/events/%event_id%. exo:id String false The Id of the public event. exo:eventType String false Event type, including Task and Event. exo:calendarId String false The calendar Id of the public event. exo:rootEventId String false The Id of each corresponding node: exo:calendarEvent. exo:fromDateTime Date false The start time of the public event. exo:toDateTime Date false The snd time of the public event. exo:participant String true The list of users being invited to the public event. exo:eventState String false The state of the public event, including: busy, available, outside. exo:repeatCount Long false The number of times that the event is repeated. exo:repeatUntil Date false The given time until when the event is repeated. exo:repeatInterval Long false The interval when the event is repeated. It can be day, week, month or year corresponding to the repetition type chosen of day, week, month or year. exo:repeatByDay String true The given days in a week on which the event is repeated. exo:repeatByMonthDay Long true The given day/date in a month on which the event is repeated. exo:recurrenceId String false The Id of each event in the event series. exo:excludeId String true The Id of the events that are removed from the event series. exo:isException Boolean false Shows whether the event is the exception in the event series or not. This case occurs when the event is removed from the repeated event series. exo:originalReference Reference false The UUID of the event that is repeated first. exo:repeatFinishDate Date false The end date on which the event is repeated. exo:viewType String false View type of the calendar. For more details, refer to the org.exoplatform.calendar.service. CalendarSetting class. exo:timeInterval Long false The interval for each action displayed each UI, for example, dragging and dropping one event in the Calendar application. exo:weekStartOn String false Defines the start date of one week, complying with the org.exoplatform.cal endar.service.CalendarSetting class. exo:dateFormat String false Defines the date format, including dd/MM/yyyy, dd-MM-yyyy, MM/dd/yyyy, and MM-dd-yyyy. exo:timeFormat String false Defines the time format, including “hh:mm a” and “HH:mm”. exo:timeZone String false The Id of the time zone, which is set by the user in compliance with the java.util.TimeZone Java class. exo:showWorkingTime false Boolean Checks if the working period is displayed or not. exo:workingTimeBegin String false Time to start working. This property only takes effect when exo:showWorkingTime is set to true. exo:workingTimeEnd String false Time to end working. This property only takes effect when exo:showWorkingTime is set to true. exo:defaultPrivateCalendars String true The list of the hidden private calendars. exo:defaultPublicCalendars String true The list of the hidden public calendars. exo:defaultSharedCalendars String true The list of the hidden shared calendars. exo:sharedCalendarsColors String true Defines the color of the shared calendar, which is in the format of [calendar id]:[color name]. exo:sendOption String false The option to notify users before sending an invitation via email: never (not sending all time), always (sending message without asking) and ask (asking before sending). WIKI_ID ID The unique ID of the wiki. NAME VARCHAR The name of the wiki. OWNER VARCHAR The owner of the wiki. TYPE VARCHAR The type of the wiki. Can be “PORTAL”, “GROUP” or “USER”. WIKI_HOME Fk The ID of the home page of the wiki. SYNTAX VARCHAR The default Wiki syntax of the wiki. ALLOW_MULTI_SYNTAX BOOLEAN | Specifies whether multiple syntaxes are enabled or not. PAGE_ID ID The unique ID of the wiki page. WIKI_ID FK The ID of the wiki of the page. PARENT_PAGE_ID FK The ID of the parent page. AUTHOR VARCHAR The last user who updated the page. NAME VARCHAR The name of the wiki page. OWNER VARCHAR The owner (creator) of the wiki page. CREATED_DATE TIMESTAMP The creation date of the page. UPDATED_DATE TIMESTAMP The last update date of the page. CONTENT VARCHAR The content of the page. SYNTAX VARCHAR The default Wiki syntax of the wiki page. TITLE VARCHAR The title of the wiki page. EDITION_COMMENT VARCHAR The default Wiki syntax of the wiki page. URL VARCHAR The URL of the wiki page. MINOR_EDIT BOOLEAN True if the last version of the page is a minor edition. ACTIVITY_ID VARCHAR The ID of the activity linked to the wiki page. DELETED BOOLEAN True if the page is deleted. TEMPLATE_ID ID The unique ID of the template. WIKI_ID ID The unique ID of the wiki of the page. AUTHOR VARCHAR The author of the template. NAME VARCHAR The name of the template. DESCRIPTION VARCHAR The description of the template. CONTENT VARCHAR The content of the template. SYNTAX VARCHAR The default Wiki syntax of the template. TITLE VARCHAR The title of the template. CREATED_DATE TIMESTAMP The creation date of the template. UPDATED_DATE TIMESTAMP The last update date of the template. WIKI_IDENTITY VARCHAR The identity of the entity (can be an user, a group or “any”). IDENTITY_TYPE VARCHAR The identity type. Can be “USER” or “MEMBERSHIP”. PERMISSION VARCHAR The permission type. Can be “VIEWPAGE”, “EDITPAGE”, “ADMINPAGE” or “ADMINSPACE”. DRAFT_PAGE_ID ID The unique ID of the wiki draft page. TARGET_PAGE_ID ID The ID of the target page. TARGET_PAGE_VERSION VARCHAR The version of the target page. NEW_PAGE BOOLEAN True if this is the draft of a new page. AUTHOR VARCHAR The author of the wiki draft page. NAME VARCHAR The name of the wiki draft page. TITLE VARCHAR The title of the wiki draft page. CONTENT VARCHAR The content of the wiki draft page. SYNTAX VARCHAR The default Wiki syntax of the wiki draft page. CREATED_DATE TIMESTAMP The creation date of the wiki draft page. UPDATED_DATE TIMESTAMP The last update date of the wiki draft page. ATTACHMENT_ID ID The unique ID of the wiki draft page attachment. DRAFT_PAGE_ID ID The unique ID of the wiki draft page attachment. CREATED_DATE TIMESTAMP The creation date of the wiki draft page attachment. FULL_TITLE VARCHAR The title of the wiki draft page attachment. ATTACHMENT_FILE_ID ID The unique ID of the file in the table FILES_FILES. USERNAME VARCHAR The username of the watcher. PAGE_ID VARCHAR The ID of the watched page. ATTACHMENT_ID ID The unique ID of the wiki page attachment. WIKI_PAGE_ID ID The unique ID of the wiki page attachment. CREATED_DATE TIMESTAMP The creation date of the wiki page attachment. FULL_TITLE VARCHAR The title of the wiki page attachment. PAGE_VERSION_ID ID The unique ID of the wiki page version. VERSION_NUMBER NUMBER The number of the page version. AUTHOR VARCHAR The last user who updated the page version. NAME VARCHAR The name of the wiki page version. TITLE VARCHAR The title of the wiki page version. CREATED_DATE TIMESTAMP The creation date of the page version. UPDATED_DATE TIMESTAMP The last update date of the page version. SYNTAX VARCHAR The default Wiki syntax of the wiki page version. EDITION_COMMENT VARCHAR The default Wiki syntax of the wiki page version. MINOR_EDIT BOOLEAN True if this version of the page is a minor edition. PAGE_ID FK The unique ID of the wiki page of the version. RELATED_PAGE_ID ID The unique ID of the related wiki page. PERMISSION VARCHAR The permission type. Can be “VIEWPAGE”, or “EDITPAGE”. PAGE_MOVE_ID ID The unique ID of the page move. WIKI_TYPE VARCHAR The type of the wiki of the page. WIKI_OWNER VARCHAR The owner of the wiki of the page. PAGE_NAME BOOLEAN The name of the wiki page. CREATED_DATE TIMESTAMP The date of the page move. EMOTION_ICON_ID ID The unique ID of the emotion icon. NAME VARCHAR The name of the emotion icon. IMAGE BLOB The emotion icon binary. The Category node is used to store all categories of forum, this node is a child node of the Forum Data node and only the Category node type can be added to the Category Home node. The type of the Category Home node which is exo:categoryHome is stored in /exo:applications/ForumService/ForumData/CategoryHome. The Category node has the exo:forumCategory type which is a child node of the CategoryHome node. 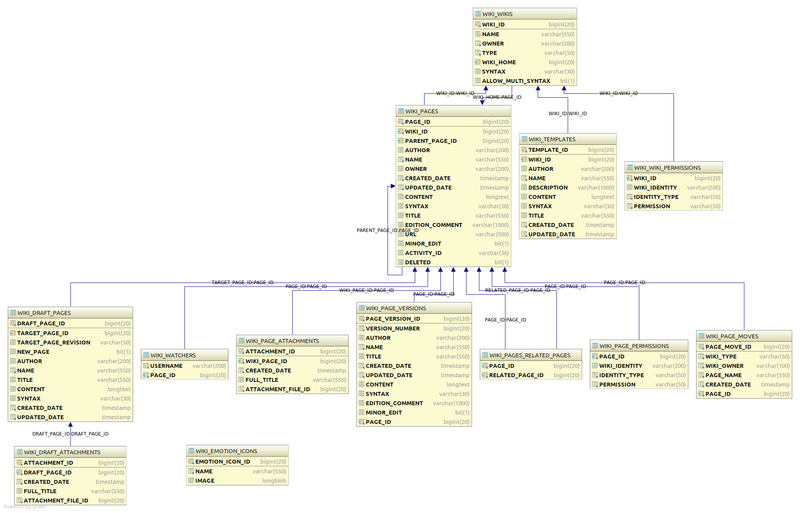 This node type is defined to allow adding child nodes as exo:forum and exo:forumRSS. exo:id String false The category Id. exo:owner String false The category creator. exo:path String false The node path of the category. exo:createdDate Date false The date when the category was created. exo:modifiedBy String false The Id of the user who made the last modification on the category. exo:name String false The category name. exo:modifiedDate Date false The date when the modifications on category were made. exo:description String false The category description. exo:moderators String true The list of moderators of the category. exo:tempModerators String true The temporary moderator of the category. exo:createTopicRole String true The topic role. exo:poster String true The list of Ids of the users and groups who can post in the category. exo:viewer String true The list of Ids of the users and groups who can only view posts in the category. exo:categoryOrder Long false The order number of category in the category list. exo:userPrivate String true The list of user Ids whose access are restricted from the category. exo:forumCount Long false The total number of forums in the category. exo:includedSpace Boolean false Checks whether a category includes a space forum or not. exo:emailWatching String true Lists email addresses which are used to watch categories/forums/topics. exo:userWatching String true Lists users who are watching categories/forums/topics. exo:rssWatching String true Lists users who are watching RSS of categories/forums/topics. exo:id String false The forum Id. exo:owner String false The forum creator. exo:path String false The node path of the forum. exo:name String false The forum title. exo:forumOrder Integer false The order number in the list of forums. Forum with smaller number will get higher order. exo:createdDate Date false The date and time when the forum was created. exo:modifiedBy String false The Id of user who modified the category. exo:modifiedDate Date false The time of modification, including date, time and time zone. exo:lastTopicPath String false The Id of the last topic in the forum. exo:description String false The description of forum. exo:postCount Long false The total number of submitted posts in the forum. exo:topicCount Long false The total number of created topics in the forum. exo:isAutoAddEmailNotify Boolean false Enables/Disables the notification email to moderators. exo:notifyWhenAddTopic String true Email addresses to notify when there is a new topic in the forum. exo:notifyWhenAddPost String true Email addresses to notify when there is a new post in the forum. exo:isModerateTopic Boolean false All new topics will be moderated if the value is set to “true”. exo:isModeratePost Boolean false All new posts will be moderated if the value is set to “true”. exo:isClosed Boolean false The forum status: closed/open. Forum is closed if the value is set to “true”. exo:isLock Boolean false The forum status: locked/unlocked. Forum is locked if the value is set to “true”. exo:createTopicRole String true The list of Ids of the users or groups who can create topic in the forum. exo:poster String true The list of Ids of the users or groups who can submit post in the forum. exo:viewer String true The list of Ids of the users or groups who can view posts in the forum. exo:moderators String true The list of user Ids who are the moderators of forum. exo:tempModerators String true The list of user Ids who are the temporary moderators. exo:banIPs String true The list of banned IP addresses. The exo:forum can add the exo:forumWatching mixin type. See its properties here. exo:inActiveDay Long False The number of days/weeks/months that the topics in forum have not been active. exo:periodTime Long False The number of days/weeks/months that the prune job will be executed to check for the old topics and deactivate them. exo:isActive Boolean False The current status of the prune job. If the value is set to “True”, the prune job will be run. exo:lastRunDate Date False The date that prune job runs for the last time. The Topic node is defined as a child node of the Forum `` node and allowed adding child nodes as ``Topic, Poll and RSS types. The node type of the Topic and Poll nodes is exo:topic, and exo:poll. exo:id String false The topic Id. exo:owner String false The user Id of the topic creator. exo:path String false The node path of the topic. exo:name String false The subject of the topic. exo:createdDate Date false The time when the topic was created. exo:modifiedBy String false The Id of the user who made the latest modification in the topic. exo:modifiedDate Date false The date when the modifications were made. exo:lastPostBy String false The user Id of the last poster in topic. exo:lastPostDate Date false The date when the last post was submitted. exo:description String false The topic description. exo:topicType String false The Id of the topic type. exo:postCount Long false The number of posts in the topic. exo:viewCount Long false The number of topic views. exo:numberAttachments Long false The number of attachments in the topic. exo:icon String false The name of the topic icon. exo:link String false The link to the topic. For example: http://localhost:8080/ksdemo/public/classic/forum/topic/%Topic-id%. exo:isModeratePost Boolean false All posts in the topic will have to wait for moderation if the value is set to “true”. exo:isNotifyWhenAddPost Boolean false When there is a new post in a topic, a notification message will be sent to the topic owner if this value is set to “true”. exo:isClosed Boolean false The state of the topic: closed/open. If the value is set to “true”, the topic is closed. exo:isLock Boolean false The lock status of the topic: lock/unlocked. If the value is set to “true”, the topic is locked. exo:isApproved Boolean false The topic is approved to be published if the value is set to “true”. exo:isSticky Boolean false If the value is set to “true”, the topic is currently sticky. exo:isWaiting boolean false The topic status. The topic is waiting for moderation if the value is set to “true”. exo:isActive boolean false The topic activity status: active/inactive. The topic is active (topic gets new posts in a period of time) if the status is set to “true”. exo:isActiveByForum Boolean false The topic status based on the forum state. For example: When the topic is active and the forum that contains it is closed, this topic will be considered as inactive. exo:canView String true List of user Ids who can view the topic contents. exo:canPost String true List of user Ids who can post in the topic. exo:isPoll Boolean false The topic contains poll if the value is set to “true”. exo:userVoteRating String true The list of user Id who voted. exo:tagId String true The list of the topic tag Id. exo:voteRating Double false The average vote score of the topic. The exo:topic can add the exo:forumWatching mixin type. See its properties here. exo:id String false The poll Id. exo:owner String false The user Id of poll creator. exo:createdDate Date false The date and time when the poll was created. exo:modifiedBy String false The user Id who modified the poll. exo:modifiedDate Date false The time when the poll is modified. exo:lastVote Date false The date of the last vote. exo:question String false The contents of the question for poll. exo:timeOut Long false The time when the polled is closed. exo:option String true The list of options for poll. exo:vote String true The list of votes by users. exo:userVote String true The list of user Ids who voted. exo:isMultiCheck Boolean false Users can choose more than one option if the value is set to “true”. exo:isAgainVote Boolean false Users can change their vote if the value is set to “true”. exo:isClosed Boolean false The poll status. Poll is closed if the value is set to “true”. The Post node is defined as the child node of Topic and allowed adding only the Attachment `` child node type. The ``Post node has the type of exo:post, and the child node type is exo:forumAttachment. exo:id String false The post Id. exo:owner String false The user Id of the poster. exo:path String false The node path of the post. exo:createdDate Date false The date time when post is submitted, including date, time, time zone. exo:modifiedBy String false The Id of the user who modified the post. exo:editReason String false The reason for editing the post. exo:modifiedDate Date false The date when the post was modified. exo:name String false The post title. exo:message String false The message of the post. exo:remoteAddr String false The remote IP address of the post. exo:icon String false The name of the icon for the post. exo:userPrivate String true The list of user Ids that are restricted from the post. exo:link String false The link to open the topic. exo:isApproved Boolean false The state of the post: approved/unapproved. The post is approved if the value is set to “true”. exo:numberAttach Long false The number of attachments in the post. exo:isActiveByTopic Boolean false The post is activity status based on the topic state. If the topic is close, all post in it will be considered as inactive. exo:isHidden Boolean false The post status: shown/hidden. The post is hidden if the value is set to “true”. exo:isWaiting Boolean false The post is in the “waiting for approval” status. The post is waiting if the value is set to “true”. exo:isFirstPost Boolean false The post is the first one in a topic if the value is set to “true”. exo:id String false The Id of tag. exo:name String false The tag name. exo:useCount Long false The number of times that the tag was used. exo:userTag String true The number of users using the tag. exo:description String false The description about the tag purpose. For example: ‘The [url] tag allows creating links to other websites and files’. exo:example String false The example about using the tag. For example: ‘[URL]http://www.exoplatform.com[/URL]’. exo:isActive Boolean false The BBCode tag is active/inactive. The BBCode tag is active if the value is set to “true”. exo:isOption Boolean false If the value is set to “true”, users can create a tag with attributes and values. exo:tagName String false The BBCode tag name. exo:userId String false The user Id. exo:fullName String false The user’s full name. exo:firstName String false The user’s first name. exo:lastName String false The user’s last name. exo:email String false The user’s email address. exo:userTitle String false The user’s title: Administrator, Moderator or User. exo:screenName String false The displayed name of user in Forum. exo:userRole Long false The user’s role. The value can be: “O”: Administrator, “1”: Moderator, “2”: User, “3”: guest. exo:signature String false The signature displayed at the end of each user’s post. exo:totalPost Long false The total posts submitted by the user. exo:totalTopic Long false The total topics started by the user. exo:jobWattingForModerator Long false The number of jobs that are waiting to be moderated. exo:moderateForums String true The list of forum Ids that user is the moderator. exo:moderateCategory String true The list of category Ids that user is the moderator. exo:readTopic String true The list of topics that user has read. exo:readForum String true The list of forums that user has read. exo:lastReadPostOfTopic String true The list of the last read posts id in a topic that user has read. exo:lastReadPostOfForum String true The list of the last read posts Id in a forum that user has read. exo:isAutoWatchMyTopics Boolean false Enables/Disables the auto-watch the topics created by user. Topics created by a user will be watched automatically if the value is set to “true”. exo:isAutoWatchTopicIPost Boolean false Enables/Disables the auto-watch posts submitted by user. Topics posted by an user will be watched automatically if the value is set to “true”. exo:bookmark String true The list of topics/posts bookmarked by user. exo:lastLoginDate Date false The date of the last login. exo:joinedDate Date false The date when user joined forum. exo:lastPostDate Date false The date of the last post. exo:isDisplaySignature Boolean false User’s signature will be displayed at the end of their post if the value is set to “true”. exo:isDisplayAvatar Boolean false User’s avatar is displayed if the value is set to “true”. exo:newMessage Long false The number of new messages. exo:timeZone Double false The time zone configured by user. exo:timeFormat String false The time format configured by user: 12h or 24h format. exo:shortDateformat String false The format of short date configured by user. For example: ‘dd/MM/yyyy’. exo:longDateformat String false The format of long date configured by user. For example: ‘dd mmm, yyyy’. exo:maxPost Long false The number of the maximum posts displayed per page. exo:isShowForumJump Boolean false Displays/Hides the forum jump drop-down list. This jump list will be shown if the value is set to “true”. exo:collapCategories String true The list of categories collapsed by user. exo:isBanned Boolean false The user’s condition. User is currently banned if the value is set to “true”. exo:banUntil Long false The time when the ban period expires. exo:banReason String false The description for the reason that user was banned. exo:banCounter String false The number of bans that user has committed. exo:banReasonSummary String true The list of ban reason summaries when a user is banned for more than one time. exo:createdDateBan Date false The date when the ban period starts. exo:from String false The user Id of the sender. exo:sendTo String false The user Id of the receiver. exo:name String false The private message subject. exo:message String false The message contents. exo:type String false The private message type: sent messages or received messages. exo:receivedDate Date false The date when the private message was received. exo:isUnread Boolean false The status of private message: read/unread. exo:categoryIds String true The Ids of the subscribed categories. exo:forumIds String true The Ids of the subscribed forums. exo:topicIds String true The Ids of the subscribed topics. The Statistic and Statistic Home nodes are used to store statistic information of forum, such as number of posts, topics, users, active users. The node types are exo:forumStatistic, and exo:statisticHome. exo:postCount Long false The total number of submitted posts in Forum. exo:topicCount Long false The number of total created topics in Forum. exo:membersCount Long false The number of the registered users. exo:newMembers String false The Id of the latest registered user. exo:mostUsersOnline String false The highest number of the online users. exo:activeUsers Long false The number of active users. The Ban IP and Ban IP Home nodes are used to store data about banned IP addresses. The exo:banIPHome node type contains the exo:IPHome child node. exo:ips String true The list of IP addresses of the banned users. exo:forumSortBy String false Sorts forum by criteria: post count, topic count, lock status. exo:forumSortByType String false Sorts forum by ascending/descending type. exo:topicSortBy String false Sorts topic by criteria. exo:topicSortByType String false Sorts topic by ascending type or descending type. exo:censoredKeyword String false The list of censored words. exo:headerSubject String false The subject header. exo:enableHeaderSubject Boolean false Enables/Disables the subject header. The subject header is displayed if the value is set to “true”. exo:notifyEmailContent String false Defines if the notification email will be sent when there is a new added topic/post. exo:notifyEmailMoved String false Defines if the notification email will be sent when there are any moved topic/post. WEB_NOTIF_ID ID The unique ID of the web notification. SENDER VARCHAR The sender of the web notification. TYPE VARCHAR The type of the web notification. CREATION_DATE TIMESTAMP The creation date of the web notification. TEXT VARCHAR The content of the web notification. WEB_NOTIF_PARAMS_ID ID The unique ID of the web notification parameter. WEB_NOTIF_ID ID The ID of the related web notification. PARAM_NAME VARCHAR The name of the web notification parameter. PARAM_VALUE VARCHAR The value of the web notification parameter. WEB_NOTIFS_USERS_ID ID The unique ID of the web notification user. WEB_NOTIF_ID ID The ID of web notification. RECEIVER VARCHAR The receiver of the web notification. UPDATE_DATE TIMESTAMP The updated date of the web notification. IS_READ BOOLEAN True if the web notification is read by the user. SHOW_POPOVER BOOLEAN True if the web notification must be shown is the notifications dropdown list. RESET_NUMBER_BADGE BOOLEAN True if the badge of the number of web notifications is reset. EMAIL_NOTIF_ID ID The unique ID of the email notification. SENDER VARCHAR The sender of the email notification. TYPE VARCHAR The type of the email notification. CREATION_DATE TIMESTAMP The creation date of the email notification. SENDING_ORDER NUMBER The sending order of the email notification. EMAIL_NOTIF_PARAMS_ID ID The unique ID of the email notification parameter. EMAIL_NOTIF_ID ID The ID of the related email notification. PARAM_NAME VARCHAR The name of the email notification parameter. PARAM_VALUE VARCHAR The value of the email notification parameter. EMAIL_NOTIF_DIGEST_ID ID The unique ID of the email notification digest. DIGEST_TYPE VARCHAR The type of the email notification digest. Can be “daily” or “weekly”. 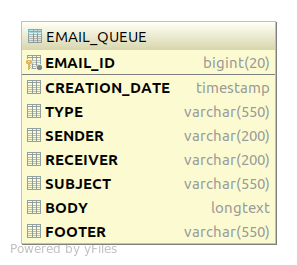 The database table EMAIL_QUEUE stores information about emails sent via the platform. EMAIL_ID ID The unique ID of the email. CREATION_DATE TIMESTAMP The creation date of the email. TYPE VARCHAR The type of the email. SENDER VARCHAR The sender of the email. RECEIVER VARCHAR The receiver of the email. SUBJECT VARCHAR The subject of the email. BODY VARCHAR The body of the email. FOOTER VARCHAR The footer of the email. SCOPE_ID ID The unique ID of the settings scope. TYPE VARCHAR The type of the settings scope. Can be “WINDOWS”, “PAGE”, “SPACE”, “SITE”, “PORTAL”, “APPLICATION” or “GLOBAL”. Name VARCHAR The name of the settings scope. TYPE VARCHAR The type of the settings context. Can be “GLOBAL” or “USER”. NAME VARCHAR The name of the settings context. SETTING_ID ID The unique ID of the settings. NAME VARCHAR The name of the settings. VALUE VARCHAR The value of the setting. CONTEXT_ID ID The ID of the context of the setting. SCOPE_ID ID The ID of the scope of the setting. The system will automatically create the Category Home node under the FAQ application node at the first time the user launches application. All users-created categories are the sub-categories of Category Home. The home of the Category node is automatically created in/exo:applications/faqApp/categories. In fact, Sub-category is also a category. FAQ has defined a mixin node type called mix:faqSubCategory to allow adding a node having the same type with category to an existing category. When a category is created, this mixin node type will be mixed to that category. exo:id String false The sub-category Id. exo:name String false Name of the sub-category. exo:userPrivate String true The list of user Ids that are restricted from the category. exo:description String false The description of the sub-category. exo:isModerateQuestions Boolean false The question post moderation status. All questions posted in the sub-category will have wait for moderation if the value is set to “true”. exo:isModerateAnswers Boolean false The answer post moderation status. All answers posted in the sub-category will have to wait for moderation if the value is set to “true”. exo:isView Boolean false The category is shown/hidden. The category will be shown if the value is set to “true”. exo:viewAuthorInfor Boolean false The category enables user to view the information of questions poster if the value is set to “true’. exo:moderators String true The list of user ids who are the category moderator. exo:createdDate Date false The time when the sub-category is created. exo:index Long false The index number of the category. Each category has a RSS child node that stores a RSS feed representing all questions in this category as the binary data type. The RSS node is stored in /exo:applications/faqApp/categories/ks.rss and its node type is exo:faqRSS. exo:content Binary false The content of RSS. The Question Home node is created from the exo:faqQuestionHome node type that is defined as a child node of category. This node cantains all question nodes that created in side a category. Only the Question node type exo:faqQuestion can be added to the question Home. The Question Home node is created as a child node of Categories /exo:applications/faqApp/categories/questions. Question node is created from exo:faqQuestion node type under the Question Home node. The Answers, Comments and Attachments node are defined as child nodes of the Question node. The Question node is created under the Question Home: /exo:applications/faqApp/categories/questions/%Question-id%. exo:id String false The question Id. exo:language String false The language of the question. exo:name String false The question details. exo:title String false The question title. exo:author String false The user Id of the question poster. exo:isActivated Boolean false The question status: activated/inactivated. The question is activated if the value is set to “true”. exo:isApproved Boolean false The state of the question: approved/unapproved. The question is approved to be published if the value is set to “true”. exo:categoryId String false The Id of the category containing the question. exo:createdDate Date false The date and time when the question was submitted. exo:relatives String true The list of the related questions Ids. exo:usersVote String true The list of user Ids who voted. exo:markVote Double false The average vote scores of the question. exo:topicIdDiscuss String false The topic Id in the forum where the question is discussed. exo:nameAttachs String true The file name of attachments in the question. exo:lastActivity String false The user Id and time when the last activity of the question was made. exo:numberOfPublicAnswers Long false The number of all posted answers that has been published. exo:link String false The link to open the question. exo:responses String true The responses of the question. exo:dateResponse Date true The date when the question received the answer. exo:responseBy String true The user Id of the answer poster. A question can support multilanguages, all other languages are stored as a child node of the question and can be add to the question via a mixin node type called mix:faqi18n. After the mixin node type mix:faqi18n is added to the question, the node type exo:questionLanguageHome can be added to the question node and this node type will contain all languages node with the node type exo:faqLanguage. All display properties of the question are defined in the node type exo:faqLanguage. exo:name String false The name of the language. exo:title String false The title of the question in the selected language. exo:questionId String false The Id of the question. exo:categoryId String false The Id of the category. The Answer, Comment and Attachment node is defined as the child nodes of the Question node. Attachment node is defined as a nt:file node type and stored right under the Question node. Answers and comments node are stored under the Answer home and the Comment home node. exo:id String false The Id of the answer. exo:answerPath String false The path to the answer. exo:responses String false The content of the answer. exo:dateResponse Date false The date when the response was posted. exo:responseBy String false The Id of the user who responded the answer. exo:responseLanguage String false The language of the answer response. exo:approveResponses Boolean false The response is pending for approval if the value is set to “false”. exo:activateResponses Boolean false The state of the answer: activated/deactivated . exo:usersVoteAnswer String true The list of user Ids who voted for the answer. exo:MarkVotes Long false The average vote scores of the answer. exo:postId String false The post Id. exo:fullName String false The answer author’s full name. exo:id String false The comment Id. exo:comments String false The comment contents. exo:dateComment Date false The date when the comment is posted. exo:commentBy String false The user Id of the comment poster. exo:postId String false The Id of the post. exo:fullName String false The full name of the comment poster. exo:categoryId String false The Id of the category in which the comment is posted. exo:questionId String false The Id of the question in which the comment is posted. exo:commentLanguage String false The language of the comment. exo:fileName String false The name of the attachment file. This FAQ Setting node stores the user settings data, such as how answer is ordered (in alphabetical order or by created date), the order type (descending or ascending) or the user’s selection to sort questions by popularity. Each user has a dedicated settings data to select the display preferences in FAQ. The default setting will be used if the users has never changed and saved their setting. exo:ordeBy string false Defines how questions are ordered, by “alphabet/index” or “created date”. exo:ordeType string false The value “asc” = ascending and “des” = descending. This node stores the template for FAQ portlet. The user can edit this template online in FAQ to change the layout, skins, and more. The template is stored in an nt:file node type under the Template Home node: /exo:applications/faqApp/templateHome/nt:file. exo:owner String false The user Id of the poll creator. exo:createdDate Date false The date and time when the poll is created. exo:modifiedBy String false The Id of the user who made the last modification on the poll. exo:modifiedDate Date false The date and time when the latest modification on poll was made. exo:lastVote Date false The date and time when the last vote was made. exo:question String false The question content of poll. exo:timeOut Long false The time when the poll will be closed. exo:option String true The list of options for poll. Each option is separated by commas. exo:isMultiCheck Boolean false Enables/Disables the multi-check. Users can vote for more than one option if the value is set to “true”. exo:isAgainVote Boolean false Enables/Disables the option to vote again. Users can change their vote if the value is set to “true”. exo:isClosed Boolean false The poll status: open/closed. The poll is closed if the value is set to “true”. exo:activityId String false When a Poll is created, a new activity will be created. The activity Id is stored as preference between Poll and the activity. When there are any updates on the poll, the corresponding activities will be updated on the Activity Stream. 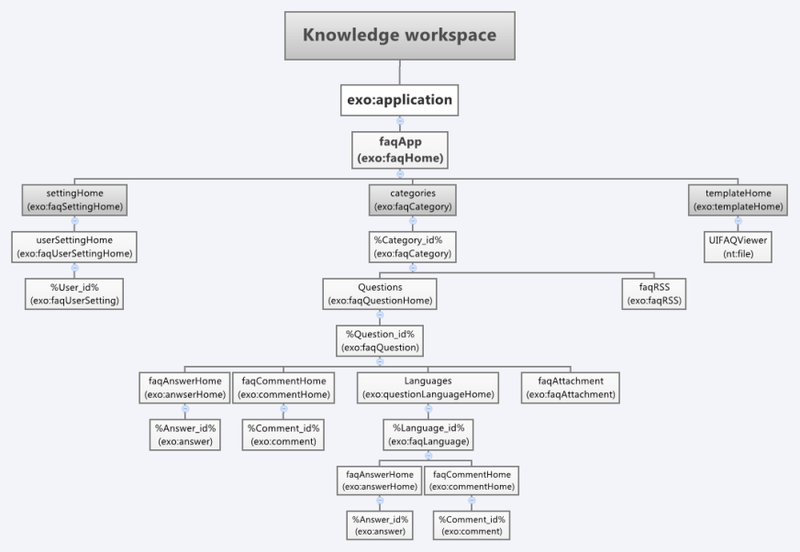 Provision of simple and explicit examples of the spaces template configuration in the Social function of eXo Platform. Information about Content types and a list of Contents used in the Content function of eXo Platform. Instructions on how to configure the FQA template and to change its look and feel, information of APIs provided by the UIComponent. The sample code of space templates can be found here. 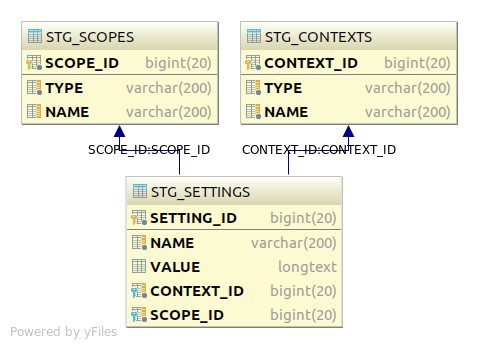 Details of 2 template types (dialog and view) applied to a node type or a metadata mixin type. Description about Content List Templates, Category Navigation Templates, and Paginator Templates which are commonly used in Content. Document types nodes can be created by the ‘Add Document’ action. Non-document types are hidden (unless the ‘Show non document types’ option is checked). Dialogs are Groovy templates that generate forms by mixing static HTML fragments and Groovy calls to the components responsible for building the UI at runtime. The result is a simple but powerful syntax. These following parameters are common and can be used for all input fields. jcrPath string jcrPath=/node/exo:title The relative path inside the current node. mixintype string with the commas (,) character. The list of mixin types you want to initialize when creating the content. editable string editable=if-null The input will be editable only if the value of this parameter is if-null and the value of this input is null or blank. multiValues boolean multiValues=true Shows a multi-valued component if true and must be used only with corresponding multi-valued properties. The default value of this parameter is false. visible boolean visible=true The input is visible if this value is true. options String separated by the commas (,) character. "options=toolbar:CompleteWCM,height:'410px',noSanitization" A list of parameters which are input while the content templates are initialized. The mixintype can be used only in the root node field (commonly known as the name field). You cannot either see the non-value field on the form or input value for them. Its value will be automatically created or defined when you are managing templates. In the WYSIWYG widget section, you already know about a set of default toolbars (CompleteWCM, Default, BasicWCM, Basic, SuperBasicWCM). In this section, you will learn how to create a RichText editor with custom buttons. Every toolbar set is composed of a series of “toolbar bands” that are grouped in the final toolbar layout. The bands items move together on new rows when resizing the editor. Put the desired button names in square bracket (“[” & “]”) and separate them by commas to create a toolbar band. You can look at the above code to know all the possible toolbar item. If the toolbar item does not exist, a message will be displayed when loading the editor. Include a separator in the toolbar band by putting the “-” string on it. Separate each toolbar brands with commas. Use slash (“/”) to tell the editor that you want to force the next bands to be rendered in a new row and not following the previous one. The last toolbar band must have no comma after it. In this case, you must be sure that the node type definition of the document you are currently editing should allow the document to have a child node named ‘exo:value’ whose node type is ‘ nt:unstructured’. All uploaded files of this upload component are stored in this ‘exo:value’ child node. The select box widget enables you to render a select box with static values. These values are enumerated in a comma-separated list in the “options” argument. The argument with no key (here “text/html”) is selected by default. In many cases, the previous solution with static options is not good enough and one would like to have the select box checked dynamically. That is what eXo Platform provide thanks to the introduction of a Groovy script as shown in the code fragment below. The script itself implements the CMS Script interface and the cast is done to get the select box object as shown in the script code which fills the select box with the existing JCR workspaces. It is also possible to provide a parameter to the script by using the argument “scriptParams”. One of the most advanced functionalities of this syntax is the ability to plug your own component that shows an interface, enabling you to select the value of the field. In the generated form, you will see an icon which is configurable thanks to the selectorIcon argument. Depending on the selectorClass, some other parameters can be added. The component org.exoplatform.ecm.webui.selector.UIPermissionSelector does not need any special parameters. The followings are predefined selectors which can be used in the action field to select an object from a list provided by the system. For example, to assign the permission to given users/groups, users must select them from a list of users/groups available in the system. Allows selecting the node path. Allows selecting the category path. Allows selecting the membership of a given group. Allows selecting users from a users list. To add an interceptor to a dialog, you can use this method uicomponent.addInterceptor(String scriptPath, String type). scriptPath string The relative path to the script file. type string The type of interceptor: prev or post. Widgets are natively part of the eXo Platform product to provide a simple and easy way for users to get information and notification on their application. They complete the portlet application that focuses on more transactional behaviors. The “options” argument is used to tell the component which toolbar should be used. By default, there are five options for the toolbar: CompleteWCM, Default, BasicWCM, Basic, SuperBasicWCM. CompleteWCM: a full set of tools is shown. The following buttons are shown: Source, Templates, Show Blocks, Cut, Copy, Paste Text, Undo, Redo, SpellCheck, WCM Insert Gadget, Flash, Table, Insert Special Character, WCM Insert Content Link, Bold, Italic, Underline, Strike Through, Justify Left, Justify Center, Justify Right, Justify Full, Ordered List, Unordered List, Text Color, Background Color, Remove Format, Link, WCM Insert Portal Link, Unlink, Anchor, Style, Font Format, Font Name, Font Size, Maximize. Default: a large set of tools is shown, no “options” argument is needed in that case. The following buttons are shown: Source, Templates, Cut, Copy, PasteText, Undo, Redo, SpellCheck, RemoveFormat, Bold, Italic, Underline, Strike Through, Ordered List, Unordered List, Link, Unlink, Anchor, Image, Flash, Table, Special Character, Text Color, Background Color, Show Blocks, Style, Font Format, Font Name, Font Size, Maximize. BasicWCM: a minimal set of tools is shown. The following buttons are shown: Source, Bold, Italic, Underline, Strike Through, OrderedList, UnorderedList, Outdent, Indent, Justify Left, Justify Center, Justify Right, JustifyFull, Blockquote, Link, Unlink, WCM Insert Portal Link, WCM Insert Content Link, Show Blocks, Style, Font Format, Font Name, FontSize, Maximize. The following buttons are shown: Source, Bold, Italic, Underline, Strike Through, Ordered List, Unordered List, Outdent, Indent, Justify Left, Justify Center, Justify Right, Justify Full, Blockquote, Link, Unlink, Show Blocks, Style, Font Format, Font Name, Font Size, Maximize. The following buttons are shown: Source, Bold, Italic, Underline, Justify Left, Justify Center, Justify Right, Justify Full, Link, Unlink, WCM Insert Portal Link, WCM Insert Gadget, WCM Insert Content Link. By using Content, all the stylesheets of each site can be managed online easily. You do not need to access the file system to modify and wait until the server has been restarted. For the structure, each site has its own CSS folder which can contain one or more CSS files. These CSS files have the data, and the priority. If they have the same CSS definition, the higher priority will be applied. You can also disable some of them to make sure the disabled style will no longer be applied into the site. For example, the Platform demo package has two main sites by default: ACME and Intranet. The ACME site has two CSS files called BlueStylesheet and GreenStylesheet. The blue one is enabled and the green one is disabled by default. All you need to test is to disable the blue one (by editing it and setting Available to ‘false’) and enable the green one. Now, back to the homepage and see the magic. Remember the cache and refresh the browser first if you do not see any changes. Normally, this is the main reason why the new style is not applied. When creating/editing content with CKEditor, the Enter mode in CKEditor will determine the default behavior when users press the Enter key. 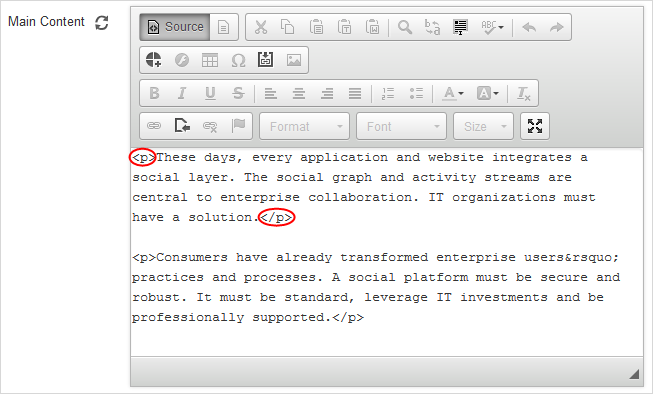 In eXo Platform, when you press the Enter key inside an editable text region, a new <p/> paragraph is created in the Source editor by default as below. However, you can change the default behavior of the CKEditor Enter mode (<br/> line breaks or <div/> blocks) when creating a new dialog. For example, if you want the Enter mode to be displayed as <br/> rather than <p/> in CKEditor, simply add the following to the dialog. Click Content > Content Administration on the top navigation bar. Select Templates, then click corresponding to one template (for example, Web Content) to open the View & Edit Template form. Select the Dialog tab, then click corresponding to the dialog that is currently used by the template (for example, dialog1). i. Click on the Action bar. ii. Select the template (Web Content in this example). iii. Enter the content with line breaks by hitting the Enter key. iv. Select in the Main Content field. The behavior of Enter mode is now changed into <br /> as below. Finally, to display the selected tab, simply add it to the style of UITabContent class. Display the exo:date property of the content node in a desired format. For example: “MM DD YYYY” or “YYYY MM DD”. Display the translation of the Sample.view.label.node-name message in different languages. In Content, the stylesheet of a node is an optional template embedded in the View template, such as File. To create the stylesheet for the View template, you just need to add the content of the stylesheet into the Content field of the CSS tab. Documents.gtmpl Displays contents under a content list with a NodeType icon or the illustration on the left of the corresponding content. OneColumn.gtmpl Displays contents under one column. The illustration of each content is displayed on its left. TwoColumns.gtmpl Displays contents under two columns. The illustration of each content is displayed on its left. AccessibleBreadcrumb.gtmpl This template is designed according to the WCAG 2.0 (Web Content Accessibility Guidelines)to display content under the breadcrumb format. AccessibleSitemap.gtmpl This template is designed according to the WCAG 2.0 (Web Content Accessibility Guidelines) to display all content under the sitemap format. AccessibleBanner.gtmpl This template is designed according to the WCAG 2.0 (Web Content Accessibility Guidelines) to display the banner. AccessibleToolbar.gtmpl This template is designed according to the WCAG 2.0 (Web Content Accessibility Guidelines) to display the toolbar. AcmePowers.gtmpl Displays the content in the ACME website. Announcement.gtmpl Displays the announcement content. The Category Navigation Templates display all contents under the categories. CategoryList.gtmpl Displays categories as a navigation bar. AccessibleNavigation.gtmpl This template is designed according to the WCAG 2.0 (Web Content Accessibility Guidelines) to display categories as a navigation bar. AcmePowersCategoryTree.gtmp Displays category trees of the ACME site. It can be also used for other sites if it is available. The Paginator Templates allow you to paginate the content into various pages. DefaultPaginator.gtmpl Allows you to paginate content. EmptyPaginator.gtmpl The empty paginator template. Information about the configuration plug-in which is used to automatically set up a default template for the FAQ portlet, and details of properties of the template configuration plug-in. Instructions on how to change the template FAQ viewer, either by using plug-in or by using the Edit mode. Introduction to UIViewer, details of APIs and classes (CategoryInfo, QuestionInfo, SubCategoryInfo). Configuration plug-in is used to automatically set up a default template for the FAQ portlet. When the FAQ service starts, it will get values which are returned from the TemplatePlugin component to initialize the template for the FAQ portlet. The template configuration plug-in is configured in the templates-configuration.xml file. At runtime of the FAQ Service, FAQService component is called, then templates-configuration.xml file is executed. The component-plugin named addTemplatePlugin will be referred to org.exoplatform.faq.service.TemplatePlugin to execute some objects and create default data for the Forum application. Create a file named FAQViewerPortlet.gtmpl. The content of the file is the template of the FAQ viewer. Copy this file and paste into ks-extension/WEB-INF/ks-extension/ks/faq/templates/ that is in the webapps folder of the server (Tomcat, JBoss). When the server runs, FAQViewerPortlet.gtmplwill initialize the template of the FAQ viewer. Run the server and open the FAQ Portlet. Go to edit mode and open the Edit Template tab. Edit the content of text-area-input and click Save. UIViewer is the child of the component UIFAQPortlet. It shows the main content of FAQ portlet. getCategoryInfo Empty CategoryInfo object Gets the object CategoryInfo. arrangeList (List< String > list): List of path A new list is arranged Arranges a list of paths. render (String): The content of answers or comments A new string is converted by function render Renders the content of answers or comments. 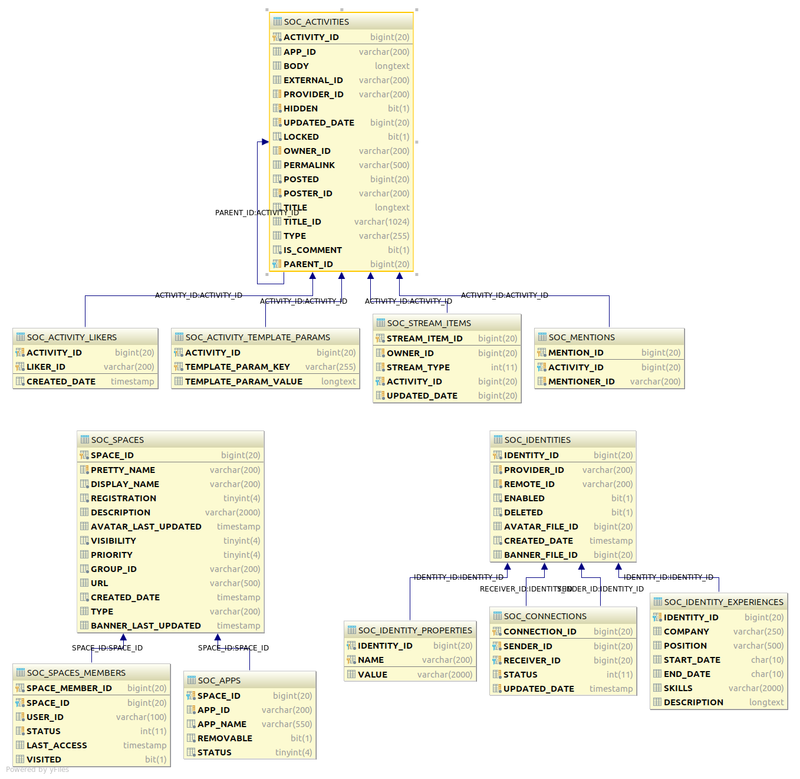 id String The JCR node name of the category node. path String The JCR node path of the category node. name String The name of the category. pathName ``List<String> `` The path to the category includes a list of category names. questionInfos List<QuestionInfo> The list of QuestionInfo object. subCateInfos List<SubCategoryInfo> The list of SubCategoryInfo object. id String The JCR node name of the question node. question String The content of the question. details String Details of the question. answers List<String> The list of answers for the question. The SubCategoryInfo class: The params of this class are the same as those of the CategoryInfo class. See here for more information. In eXo Platform, whenever an action occurs (for example, login/logout, content creation/modification), a corresponding event is sent to the Listener Service that dispatches the notification to its listeners. Listeners then can perform whatever action they want when receiving an event. The ProfileUpdatesPublisher listener (that extends ProfileListenerPlugin) is registered into ProfileLifecyle in the IdentityManager class. When his profile is updated, the below event will be broadcasted. Based on event type of avatar update, the ProfileLifecycle will dispatch that event to the avatarUpdated listener. * Broadcasts update profile event depending on type of update. The fired event is listened by ProfileListener. Information included in the event is extracted and processed. See Understanding the ListenerService for more details. Events and event listeners in eXo Platform have to follow the org.exoplatform.services.listener.Event and org.exoplatform.services.listener.Listener classes respectively. To cache these above events, you can create event listeners that must be subclasses of: org.exoplatform.services.listener.Listener<org.exoplatform.portal.config.DataStorage, org.exoplatform.portal.config.model.PortalConfig>. The related event listeners must be extended from org.exoplatform.services.listener.Listener<org.exoplatform.portal.config.DataStorage, org.exoplatform.portal.config.model.Page>. The related event listeners must be subclasses of org.exoplatform.services.listener.Listener<org.exoplatform.portal.mop.navigation.NavigationService, org.exoplatform.portal.mop.SiteKey>. org.exoplatform.portal.mop.page.PageService will broadcast the following events when a page is created/updated/removed. The related event listeners must be subclasses of org.exoplatform.services.listener.Listener<org.exoplatform.portal.mop.page.PageService, org.exoplatform.portal.mop.page.PageKey>. org.exoplatform.services.security.ConversationRegistry will fire the following events when any user signs in/out the portal. The related event listeners must be subclasses of org.exoplatform.services.listener.Listener<org.exoplatform.services.security.ConversationRegistry, org.exoplatform.services.security.ConversationState>. The related event listeners must be extended from org.exoplatform.services.listener.Listener<org.exoplatform.container.PortalContainer, javax.servlet.ServletContextEvent>. The related event listeners must be extended from org.exoplatform.services.listener.Listener<org.exoplatform.container.PortalContainer, javax.servlet.http.HttpSessionEvent>. The related event listeners must be subclasses of org.exoplatform.services.listener.Listener<org.exoplatform.services.cms.CmService, javax.jcr.Node>. CmsService will fire these events when a content is created/added. LinkManager will fire the following event when a link is added to the content. WebDavService will fire this event when a content is uploaded through WebDav. The related event listeners must be subclasses of org.exoplatform.services.listener.Listener<org.exoplatform.services.jcr.webdav.WebDavService, javax.jcr.Node>. The related event listeners must be subclasses of org.exoplatform.services.listener.Listener<java.lang.Object, javax.jcr.Node>. UIDocumentForm will fire the following event when a file is created. DeleteManageComponent will fire the following event when a file is removed from the database. AddNodeActivityAction will fire the following event when an attachment is added into the database. The related event listeners must be subclasses of org.exoplatform.services.listener.Listener<javax.jcr.Node, javax.jcr.Node>. RemoveFileActivityAction will fire the following event when a file is removed from the database. RemoveNodeActivityAction will fire the following event when an attachment is removed from the database. WCMPublicationService will fire the below event when the document publication state is changed. AuthoringPublicationPlugin will fire the below event when a node is involved into a publication lifecycle. AuthoringPublicationPlugin will fire the following events when publication state of a document is changed. The related event listeners must be subclasses of org.exoplatform.services.listener.Listener<javax.jcr.Node, java.lang.String>. UIPublicationPanel will fire the below event when the document version is restored. CommentService will fire the following events when a comment is created/updated/removed. NewFolksonomyService will fire the following events when a tag is created/removed. CmsService, MoveNodeManageComponent and PasteManageComponent will fire the below event when a node is moved to another place. RemoveNodeActivityAction will fire the below event when a node is removed from the database. UIDocumentForm will fire the below event when a new node is created. EditFilePropertyActivityAction will fire the below event when a property of file is modified. EditPropertyActivityAction will fire the below event when a property of document is modified. RemoveFilePropertyActivityAction will fire the below event when a property is removed from file. The listeners of Property events must be subclasses of org.exoplatform.services.listener.Listener<javax.jcr.Node, java.lang.String>. TaxomonyService will fire the following events when a category is added to/removed from a node. CreatePortalArtifactService will fire the below event when artifacts are deployed for a new site. The related event listeners must be subclasses of org.exoplatform.services.listener.Listener<org.exoplatform.services.jcr.ext.commonSessionProvider, java.lang.String>. All Social event listeners must be extended from the org.exoplatform.social.common.lifecycle.AbstractLifeCycle<T extends LifeCycleListener<E>, E extends LifeCycleEvent<?,?>. A user joined/left a space. A user is granted/revoked the “manager” role. Description, avatar or access permission of a space is updated. A user requests to join or is invited to join a space. A topic is added/updated/moved/splitted or more than 2 topics are merged.